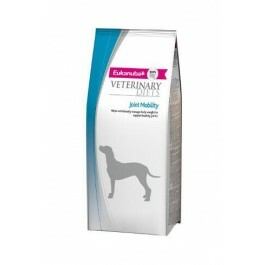 Eukanuba Veterinary Diet Joint Mobility utilises a total body approach, starting with glucosamine and chondroitin sulfate the building blocks of cartilage, along with an adjusted omega-6: omega-3 fatty acid ratio to help soothe the joint. In addition, Joint Mobility is made with 26% less fat* plus L-carnitine to help your dog maintain a healthy weight. The inclusion of antioxidants help maintain a healthy immune function, this is especially important for ageing dogs. Joint mobility for Dogs is intended to help with the reduction of excessive body weight. It is recommended that a veterinarian's opinion be sought before and during the use of this product in order to determine the needs of your dog. In addition, this formula provides all the nutrients needed to support the overall health and well-being of your dog. Feeding Instructions: It is recommended that a veterinarian's opinion be sought before use or before extending the period of use. Your veterinarian may suggest specific feeding instructions for your dog, or ask you to follow the standard portions shown in the feeding chart. Recommended time for use: as long as advised by your veterinarian.